Hair extensions – a few hours in the salon and you have long hair that looks like a dream. But is there a downside? Professionally made hair extensions can completely transform your appearance without affecting the health of your hair, but if they are done wrongly extensions can seriously damage your hair. You should know what to expect before going to the salon. Would hair extensions cost a fortune? Yes, extensions done by a professional hair extension artist and made from high quality hair would cost you several hundred dollars. The price really depends on the quality of the hair used – Asian hair is cheaper, while European hair costs 2-3 times more. If you want good looking hair – especially blond hair – you will have to pay for European material. Online you might find hair extension ‘starter kits’ with complete instructions, which aren’t difficult to apply. So if you feel adventurous, you can buy a do-it-yourself kit and save significantly. If done correctly, this type of hair extension looks as good as any salon made one. If you decide to follow this route, though, make sure that you order high quality hair. What types of hair extension are available? The two major types of hair extension are individual strands and wefts. Individual strands, as the name implies, are attached one piece at a time to your own hair, usually using glue, or with waxes and polymers. The problem here is that most of the attachment methods require coating your natural hair with rather unfriendly chemicals. Attaching these extensions isn’t a problem, but removing this type of extension can seriously damage your hair. Wefts, on the other hand, are braided into your hair, so no chemicals are needed. A weft looks like a curtain of hair held together at the top and hanging freely toward the bottom. It is braided into your hair around the midline of your head – about ear level. It is safer for your hair but, on the downside, as you own hair grows wefts have to be rebraided – about once every two months. What materials are used for hair extensions? First, hair for extensions can be either synthetic or real human hair. Synthetic extensions are cheaper, of course, but you get what you pay for – they look like artificial strands attached to your hair. They’re not very pleasant to the touch, either. Human hair used for extensions gives better results. Human extension hair differs by origin. The most common are hair from India and Asian countries. They are great, if you are an Asian woman yourself. Unfortunately this type of hair has a noticeably different texture from a Caucasian’s natural hair, so on Caucasian women they just don’t look right. European hair is of better quality, usually originating from Spain and Italy, is of better quality but costs more. The only problem is that its natural color is usually coal black. To make a blond extensions out of them, Italian or Spanish hair needs to be heavily bleached. 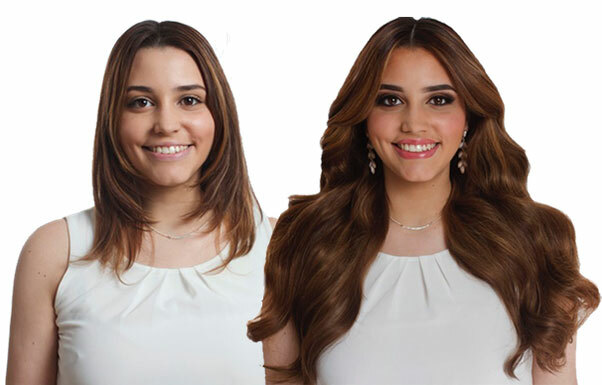 See comparison of human hair extensions made from different types of hair. There are also so-called ‘raw’ or ‘virgin’ hair. This is European hair coming from Central and Eastern European countries, like Russia and Poland. The advantage of this hair that it is naturally light and of a very high quality. However, this type of hair is difficult to find and costs an arm and a leg.